PRESIDENT Rodrigo R. Duterte maintained his “very good” net public satisfaction rating this quarter on the back of a sharp increase in his bailiwick Mindanao that cushioned a significant decline in Balance Luzon, according to a Social Weather Stations (SWS) survey. Results of the survey -- conducted on March 25-28 via face-to-face interviews with 1,200 adults nationwide and with sampling error margins of ±3 points for national percentages, and ±6% each for Balance Luzon, Metro Manila, Visayas and Mindanao -- found 75% satisfied, 12% undecided and 12% dissatisfied with Mr. Duterte’s performance this quarter. That yielded a net satisfaction rating of +63 (% satisfied minus % dissatisfied), classified as “very good,” steady from the December survey’s +63 (77% satisfied against 13% dissatisfied). Mr. Duterte’s steady overall net satisfaction was buoyed by his 13-point gain in Mindanao to +87 from +74, classified as “excellent” and the best leading among all geographical areas. However, Mr. Duterte had a drop of nine points in “Balance Luzon” at “very good” +51 (68% satisfied, 17% dissatisfied) in March from +60 (74% satisfied, 14% dissatisfied) in December last year, SWS said. Sought for comment, Ramon C. Casiple, executive director of the Institute for Political and Electoral Reform, attributed the significant changes in Mr. Duterte’s net satisfaction ratings in Mindanao and Balance Luzon to the seeming unequal attention given by the government to the two areas. “[The survey result] follows normal curve as other presidencies,” Mr. Casiple also said of the survey, in which Mr. Duterte’s latest rating hovered in the +60 range enjoyed by his predecessors Corazon C. Aquino early in 1987, Fidel V. Ramos early in 1993, and Joseph E. Estrada early in 1999. 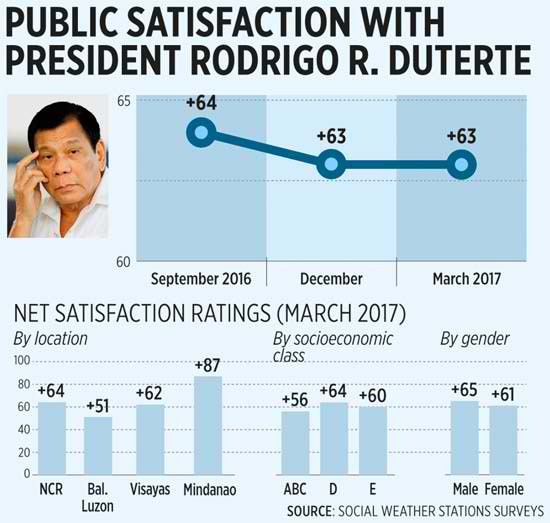 Satisfaction with Mr. Duterte stayed “very good” in the Visayas at +62 (75% satisfied, 12% dissatisfied, correctly rounded) in March, up by one point from +61 (76% satisfied, 15% dissatisfied) in the December poll. Satisfaction also stayed “very good” in both urban and rural areas, though down three points in the former (to +63 from +66) while up two points in the latter (to +63 from +61). Mr. Duterte’s net scores similarly remained “very good” across socioeconomic classes. The rating steadied at +56 from +52 among respondents belonging to class ABC, and was consistent from last December at +64 among class D or the masa, and steadied at +60 from +61 in class E.
The President’s net satisfaction rating among men stayed “very good” at +65 (77% satisfied, 12% dissatisfied) in March, similar to +66 (79% satisfied, 13% dissatisfied) in December. It has not changed among female respondents at +61 from last December. Mr. Duterte’s satisfaction ratings among age groups were mixed. His score among 18- to 24-year olds fell by one grade from “excellent” to “very good,” declining 11 points to +59 (73% satisfied, 14% dissatisfied) this quarter from +70 (81% satisfied, 11% dissatisfied). Among 25- to 34-year olds, Mr. Duterte’s score rose by one grade from “very good” to “excellent,” yielding +71 (79% satisfied, 8% dissatisfied), five points from last December’s +66 (78% satisfied, 12% dissatisfied). It remained “very good” among 35- to 44-year olds at +59 that was nevertheless six points below the +65 in the previous quarter. Satisfaction among 45- to 54-year olds stayed “very good” at +64 (78% satisfied, 14% dissatisfied), barely changing from +65 (77% satisfied, 12% dissatisfied) in December. Among respondents 55 years old and above, Mr. Duterte’s net rating stayed “very good” at +61 (74% satisfied, 13% dissatisfied), up five points from +56 (73% satisfied, 17% dissatisfied) in December. Among respondents who had college degrees, Mr. Duterte’s net rating retained its “excellent” grade and climbed four points to +76 (85% satisfied, 8% dissatisfied, correctly rounded) from +72 (82% satisfied, 10% dissatisfied). Among high school graduates, it logged a decline of eight points but remained “very good” at +60 (74% satisfied, 14% dissatisfied) from +68 (79% satisfied, 11% dissatisfied). Among elementary school graduates, the net rating remained “very good” at +64 from +56. Mr. Duterte’s net rating likewise stayed “very good” among non-elementary school graduates, edging up three points to +60 from +57. “This reflects the Filipino people’s continued confidence and trust (in) the President and his administration; and is a validation that the current government is headed in the right direction,” Mr. Abella said. “We hope this further engages the public to support all the programs towards a trustworthy government, lasting peace, and a nation the Filipino people deserve,” he added.